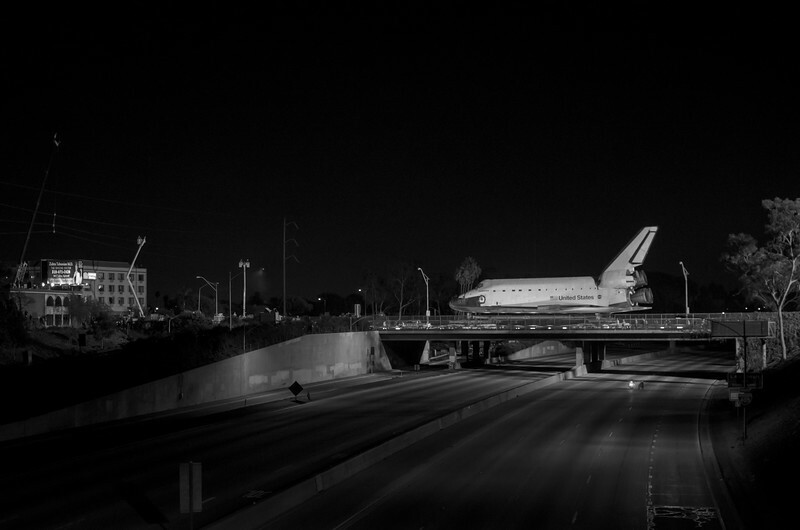 Not only couldn't I resist seeing the Space Shuttle Endeavour being ferried over the 405 freeway in Los Angeles, I actually stopped at the camera store on the way there and bought a new 35mm 1.8 lens. Click above to see a larger image. My justification: no point driving to the Westside to get a crappy shot of the space shuttle. I shot this from the bridge that carries Florence Avenue over the freeway; the shuttle was on Manchester getting a tow from a Toyota Tundra. There was more than a few others on the bridge and we had to wait about two hours for the action to get underway. I would have waited all night -- this scene will never, ever happen again. I converted the photo to black and white; I just like how it looks. I also left a lot of black space above the shuttle, a reference to its 25 previous journeys.